Woodward, Gratiot, Michigan Avenue, and M-59. When a bill to establish a regional transit authority in metro Detroit came before the Michigan Legislature four years ago, it named only those four regional corridors as the agency’s focus, prompting concerns by some – including ourselves – that the authority might overlook the pressing transit needs across our whole region. Thankfully, the draft Regional Master Transit Plan released by the RTA at a series of public meetings this month is so much more than that. If voters approve a 1.2 mill property tax in November – equivalent to $8/month for the owner of a $200,000 home – the plan will create a transit system better than anything metro Detroit has seen in generations. Map of the full draft RTA regional transit plan. In so doing, it also largely satisfies the provisions of the Motor City Freedom Riders petition to the Big Four regional leaders: doubling existing funding for transit in the region; creating new regional rapid transit corridors; and reserving nearly (though not quite) half of new funding for bus service through the existing transit agencies, DDOT, SMART and AAATA. Is the plan a panacea for our transit-starved region? No. In order to placate the Big Four, and ensure the plan has a solid chance at the ballot box in November, the tax ask was limited to 1.2 mills, roughly doubling existing regional funding for transit. That puts us in the funding ballpark of regions like Cleveland and Atlanta, which have some rapid transit and (within their service area) slightly more extensive bus service than metro Detroit. Yet it still leaves us a far cry from places like Pittsburgh, Denver, and Seattle, which provide transit with three or four times more funding per capita. Another major limitation is the “parochialism clause” inserted in the RTA legislation at the insistence of Oakland County Executive L. Brooks Patterson, a longstanding transit skeptic. The clause requires 85% of revenues raised by the RTA to stay in the county in which they are raised. In effect, that means the wealthiest counties get the most transit – whereas those that have a lower property tax base (notably Wayne) get the least. You don’t need to be a socialist to see the problems with this provision, given the role of downtown Detroit as a major regional job center, and the fact that Detroit has the greatest number of people who rely on public transit to get around. Despite these restrictions, however, the RTA plan manages to balance regional interests to provide a strong framework for expanding transit for everyone in metro Detroit. Read on for more of our analysis. Proposed RTA rapid transit lines, including BRT and rail (dark blue). The most-talked-about portion of the RTA plan are the five rapid transit lines on major regional corridors. Four of the five are bus rapid transit lines, featuring special buses making limited stops and, for the most part, running in their own lanes to avoid congestion. Three converge in downtown Detroit. There’s the Woodward line, running out to Pontiac; the Gratiot line, extending just past downtown Mt. Clemens; and the Michigan line, going out to Dearborn and Westland before jogging south to Detroit Metro Airport. To the west, in Washtenaw County, another bus rapid transit line (likely without dedicated lanes) would connect downtown Ypsilanti and Ann Arbor, following the path of the AAATA Route 4 bus. In a major victory for Washtenaw and Wayne County, the plan also includes a regional rail service along the existing Amtrak route between Ann Arbor and Detroit’s New Center, with stops in Ypsilanti, Dearborn, and somewhere in the vicinity of Wayne-Inkster-Westland. Such train service existed for most of the past 200 years, but was discontinued in 1984 by SEMTA, the region’s last effort at a regional transit authority. The exact design of the bus rapid transit lines is still being determined. Particularly important is the fate of the Woodward line; it’s still unclear whether that line will get its own lane in the frequently congested area south of Grand Boulevard. In some cases, it could be argued that the rapid transit lines don’t go far enough; the Gratiot line, for example, lacks a connection to nearby Macomb Community College and the Partridge Creek mall. However, these lines – expected to operate every 15 minutes or better – will provide much-needed seamless rapid transit service between Detroit and the suburbs. Existing transit service in the region. Crosstown SMART service (brown lines) is especially thin. We’ve had a pretty clear picture of the rapid transit service for a couple months now, but what really excited us about the master plan unveiling was the expanded bus service on a variety of other corridors. To explain this, we need to explain that outside the city of Detroit, and a handful of major corridors, bus service – even where it exists – is really, really bad. This is because the likes of Brooks Patterson have underfunded the suburban SMART bus system for decades, and SMART focuses its meager resources on the likes of Woodward and Gratiot. Crosstown bus service is, for the most part, terrible, where it exists at all. Even SMART’s 9 Mile route, 710, which runs through densely populated communities like Southfield, Ferndale, and Warren, runs only once every thirty to forty minutes for most of each weekday. Farther out, it’s even worse. SMART’s 13/14 Mile 760 runs once every 45 minutes, tops, and doesn’t run at all past about 8 pm. The RTA master plan deploys the sizable suburban tax base to rectify that situation with 11 “cross-county connector” services – generally following existing DDOT and SMART routes. 7 of them extend into the city of Detroit, including Grand River, Van Dyke, Jefferson, Fort-Eureka, Greenfield and Plymouth. Four others, including 9 Mile, 12 Mile (East and West), and 15 Mile, connect Macomb and Oakland County. Notably, 4 of them also go where no regular transit service currently exists: the Plymouth route extends into Livonia, while the 12 Mile, 15 Mile and Grand River routes reach into Novi and Wixom, the region’s largest job center without transit access. The RTA has stated that these services will be operated by the existing transit providers: DDOT and SMART, although exactly how they will be divvied up remains to be decided. While less flashy than the regional rapid transit lines, these cross-county connectors could be just as important. For a truly regional transit system, that serves all riders – including those without cars who can’t simply drive to a park-and-ride lot – it’s important that the system have strong bones, not just a few major spines. It’s worth noting that the “cross-county connectors” primarily cover suburban areas. This may be inevitable, given the “parochialism clause.” Moreover, DDOT bus service, while needing improvement, is already relatively frequent along most major corridors inside the city, and the improved suburban routes will be critically important for Detroiters seeking access to suburban jobs. 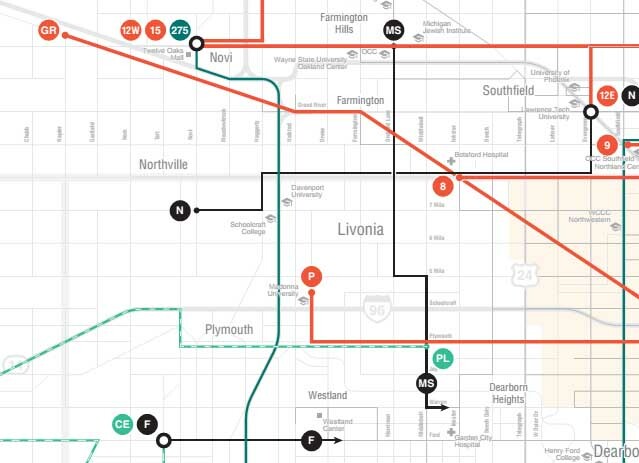 In addition to the “cross-county connectors,” the RTA plan includes eight new “Local Bus” routes. These new routes may lack the flash of bus rapid transit, but they’re no less important, as they extend bus service into suburbs – like Livonia, Northville, Waterford, and Rochester Hills – that presently “opt out” of SMART and receive no bus service as a result. Finally, the RTA plan includes several new express bus routes to downtown Detroit and Metro Airport, serving suburban commuters, as well as expanded paratransit service in the region – exactly how much remains unclear. Some of the language we’ll hear around the RTA plan may be a bit exaggerated. Again, given the limitations on funding, the RTA proposal will not bring transit service in metro Detroit up to the level of the most transit-supportive metro areas. We’d need far more funding to make that happen. Unfortunately, in the current political environment, that just wasn’t possible – yet. However, the RTA plan – if approved by voters in November – would be a massive step towards a better transit system in the region, one that makes transit more attractive to more people and drastically improves service for the 100,000-plus people in the region who already rely on the bus. The Motor City Freedom Riders are proud to give the plan our enthusiastic support. Now we need to make it a reality. Join us at the Regional Transit Authority board meeting this Thursday, 2 pm, July 21, 1001 Woodward at Campus Martius to give testimony on behalf of the plan and urge the RTA board to place it on the November ballot. We’ve been waiting for decades, and there’s not a moment to lose. Editor’s Note: This is a guest editorial originally posted here at the Motor City Freedom Riders website and is used with their express permission. The opinions contained are solely those of the author, and not necessarily Daily Detroit. More about the Motor City Freedom Riders here. If you’d like to join the conversation with your own ideas, we encourage you to get in touch.